During Christmas and Advent for our homeschool studies we take a break from alot of our regular studies focus our studies on Christmas Around the World. This makes for an excellent Christmas Tradition. It is also is great to teach the kids what other children do around the world. Each year we add to our studies or I switch things around to keep it interesting. For my oldest, Bookworm, I add more into it then I do for the younger ones. Usually though all the kids participate in everything together. We have a great time and it is so much fun!!! December 1st of this year we will kick off our studies with a trip to the Polar Express here in WA. We are very excited about this. My kids love trains so much! December 2nd is the official start of Advent so we will begin our Advent studies. 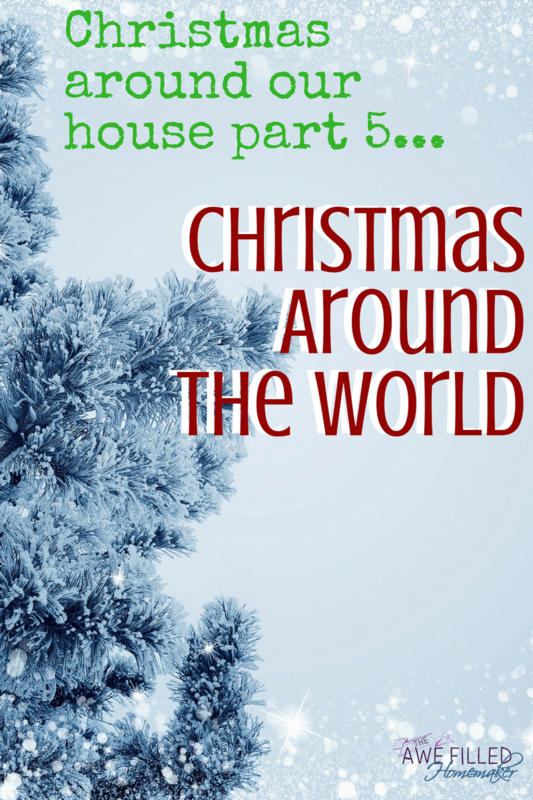 On Monday, we officially begin our Christmas Around the World studies. We have several books that we love to use, they are listed in my Christmas book list post Here, we also have several other resources that we use. I will post them in just a minute. One thing we like to do in our house is learn more about the meals and dished that are prepared in the countries that we are studying. Here is a wonderful idea…baking cookies from around the world! Here is am excellent list Christmas Cookies from Around the World. I also have a cook book that has many recipes from around the world listed if you want to prepare a whole dinner to add to your studies. So here are some resources to get you started…..
Pintrest has a TON of resources and you can follow me HERE on pinterest. I hope this gets you started and if you have any questions, just ask me! This is our 4th year of doing Christmas Around the World and I hope it is a blessing to your family, as much as it is to ours. During the month of December stay tuned and I will post pictures and updates of our studies :).